In your cottage when you arrive and refreshed daily with maid service so that you can eat anytime - to get that early start to your day! 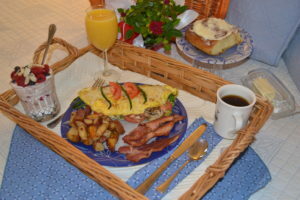 Each morning you will have a hot breakfast in a basket delivered to your cottage or room at an agreed upon time to enjoy a nice, leisurely breakfast in bed or sitting in your adirondack chair on your private deck! Delivered right to your Cottage!! !